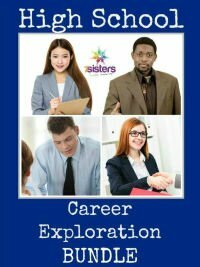 Here’s how to do Career Exploration in homeschool co-op. Each week give the students an assignment. The next week they will come back and discuss what they have discovered together. This course produces a LOT of openness and vulnerability for teens (if they are into that). If they are shy, you may have to model the kind of discussion you want or break the them into 2’s or 3’s to discuss. Have the kids list the Careers of everyone in their families (including grandparents and other extended family). Homework: Complete the Career Exploration Questionnaire. Discuss the Career Exploration Questionnaire. This questionnaire helps homeschool high schoolers look at the role models God has placed in their lives. What have your students learned from them? Have the students share ideas and list on a whiteboard. They will learn from each other. Homework: Read articles on Career Exploration in the Bundle to get a good idea of how to make the most of the Career Exploration process. Discuss articles on Career Exploration in the Bundle. Have your teens list together the most important things they will be looking for as they go through the Career Exploration process. Homework: Do Lesson I in the Career Exploration Workbook. Discuss Lesson I from the Career Exploration Workbook. Homework: Do Lesson II in the Career Exploration Workbook. Discuss Lesson II from the Career Exploration Workbook: Have everyone share what they discovered. This is a BIG section. You may end up spending several weeks on this, if so adapt the syllabus. Homework: Do Lesson III in the Career Exploration Workbook. Discuss Lesson III from the Career Exploration Workbook. This is a FUNDAMENTAL part of the course. Have the teens discuss this in detail. Homework: Do Lesson IV in the Career Exploration Workbook. Discuss Lesson IV from the Career Exploration Workbook. This is often difficult for Christian teens, since they want to be humble. Remind them that recognizing strengths and talents is not about bragging but IS about acknowledging that God placed those in them for a reason. Homework: Take the Jung Typology Test. This FREE personality test is a short version of the famous Myers-Briggs Personality Test. After answering 70 short questions, you will receive a 4-letter score (like INFJ, for instance). You will then have a chance to click on a box that will give you some suggestions regarding good career fits for that personality type. Be sure to print those suggestions and bring to co-op. Discuss the results of their personality test and the job suggestions. For more ideas visit Keirsey.com. Homework: Take the MyNextMove interest survey. This is a wonderful, FREE interest survey from the U.S. Department of Labor. Be sure to print your results and bring to co-op. Discuss the results of My Next Move. Homework: Do Lesson V in Career Exploration Workbook. Print up or write down ideas. This part takes some clicking and exploring, don’t skip it! Discuss results of Lesson V in Career Exploration Workbook. Share and discuss what students are thinking as they wrote their papers. Homework: Write your personal mission statement. This will help homeschool high schoolers refine their career searches and think about the best training for those careers. Homework: Based on what they have learned, list several careers that might be possibilities. Look up information about them at MyNextMove’s Browse Careers by Industry box. Be sure to print what you find and bring to co-op. Homework: Brainstorm a list of experiences and connections they could do in career interest areas. Discuss and add to their brainstorm list. Discuss how to do resumes. Homework: Get to work on resume. Be sure to proofread carefully and bring to co-op. Share resumes, give suggestions (students should join this discussion). Explain how to do cover letters. Homework: Write cover letter. Proofread carefully and bring to co-op. Share cover letters, give suggestions (students should join this discussion). Explain interview skills. Homework: Have students read the interview skills lesson. Remember that any co-op field trip can become a career exploration field trip, too. Ask a few questions about the field trip guide’s training and experiences working in the field. Next Post: Homeschool Highschool Podcast Ep 14: Readers Theater Party- It’s COOL!